OMG, how can I answer this question? As you might know, I love trying out new systems and in my vast collection there are several very good free role-playing games. I was going to my hard drive and looking for those which came out in the last 12 months, but I'm not sure which ones would count. Thus, I don't limit the timeline for this one. Lady Blackbird by John Harper. Why? Back when I stumbled over it (2009?) it was the first "indie" RPG I read. It has these cool mechanical bits like the Keys (they come from Solar System/The Shadow of Yesterday, I think) and this focused game setup and implied setting. The advice for the GM is pretty solid and the graphic design is neat, too. Unfortunately, the game is not genre-neutral, instead it's set up in a distinctive way. There are "hacked" versions of it, one of them tries to make this a universal game. Check out the list here. 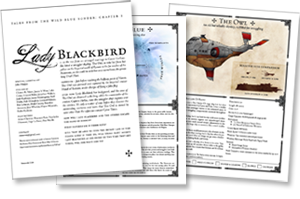 Lady Blackbird is great for one-shots and one of the first games I GM'ed. I think John Harper's patreon has a sequel to this game, but I'm not 100% sure as these are "patreon-only".